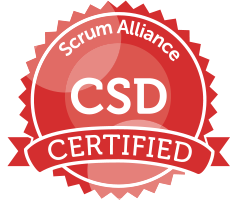 Achieving the Certified Scrum Developer® (CSD) certification is an ever-increasing requirement for programmers working in an Agile environment. It demonstrates that you have a working understanding of Scrum principles and have learned specialized Agile engineering skills. To be eligible for certification you must attend all class days, as an in-class participant; remote attendance is not permitted by the Scrum Alliance. We give you an opportunity to determine which course combination you would prefer. First, start by taking Certified ScrumMaster® Certification Training (Course 1813, 2 Days). Then, register to take the follow-on course that suits you best from the two choices below. Optimize product delivery with Certified Scrum Product Owner® (CSPO) certification. Demonstrate your Scrum expertise as a Certified Scrum Professional® (CSP). Learn the core concepts of Kanban with the TKP Certificate. Very specific course to learn about a methodology and then pass the exam to become certified in it - so it was all useful.